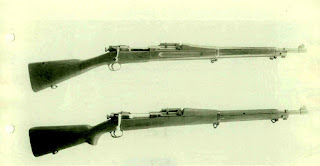 There is much love for these great old "wooden" rifles. 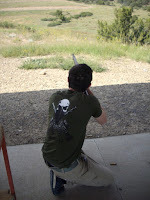 Anyone who would like to learn how to shoot them well, should check out "Project Appleseed". And if you fire it wearing just an ordinary shirt, with the standard issue steel buttplate, you'll gain a whole new appreciation for the sturdiness of WWI doughboys. You'll also understand why they tended to wear a t-shirt, wool shirt, blouse, and greatcoat, back in the day. But there had to be a certain satisfaction in seeing what you hit go down, and stay down. You would think that having been on the track team one year in school, I would know that one-half mile = 880 yards, and hence the White Buffalo is more than half a mile away, not merely more than a quarter mile. Thanks to the now self-deleted commenter for reminding me. Also, I re-did the video, hoping that the new upload works better. 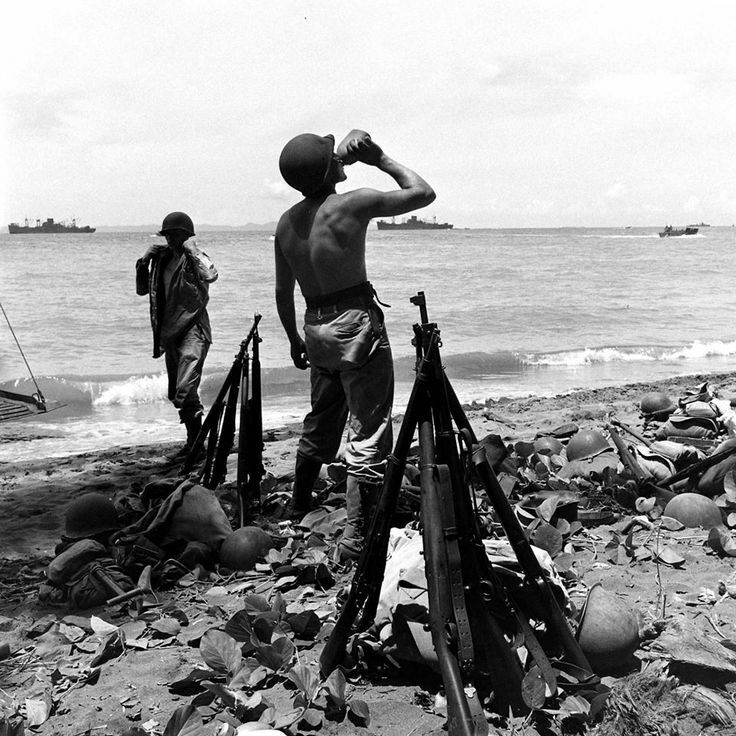 The "battle sight" was calibrated for 547 yards because 547 yards is 500 meters. That is true, it is 500 meters. On the other hand, you don't see the American military c. 1900 employing metric measurements. After all, the rear sight is graduated in yards. And settling on 500 meters as a "battle sight" seems to me to reflect some Colonel Blimp-type officer's memories of banging away at the Comanches on the Texas prairie thirty years before. It's not what you need in the jungle of Guadacanal. A quick look at ballistics programs suggests a 500m zero with standard 150gr. .30-06 gives you a max ballistic climb of about 20 inches. Ignoring windage effects, if you aim at a person's belt buckle (center mass) with that zero, at everything from muzzle to 500m you deliver a mortal hit, particularly everything between 300-500m. As for Col. Blimp, have a look at the distances involved at Kettle/San Juan Hill in Cuba, a scant 5 years before the Springfield's adoption (and which campaign was no small impetus for going with a Mauser clone bolt-action to begin with). 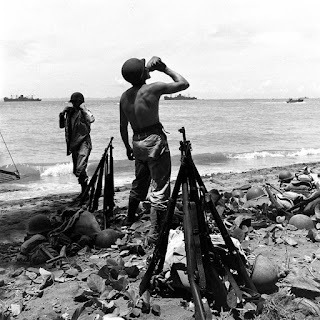 Guadalcanal and even the Caribbean jungle campaigns of the 1920s-30s were decades in the future in 1903, and a small kerfluffle in France one might recall came betwixt the two. It's true that the outnumbered Spanish did some shooting with their Mausers at San Juan Hill. (The gods must have loved Teddy Roosevelt, since the Spanish did not pick him off when he got ran his horse into the barbed wire.) The dismounted US cavalry troopers trudging up those open slopes would have been in deep doo-doo had they not been covered by the Gatling guns – and the Spanish knocked out one of those. 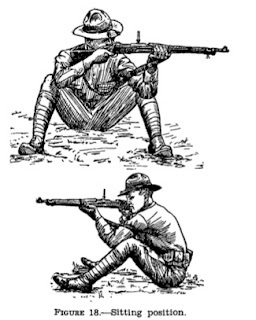 But the Blimpishness of the original rear sight is made clear by the adoption of the much simpler and more soldier-friendly sight on the 1903A3, wouldn't you say? It was graduated only to 800 yards, and I really doubt that anyone employed that setting much away from the shooting range. Many, many years ago my father bought a 1903A3 made by Remington from the DCM. It was subsequently "sporterized" with a turned down bolt handle and a new safety to clear a scope and a replacement stock. I've got it now and how I wish it was in original condition. Friends had the A$ version that had been made for use by snipers with a turned down bolt handle and a scope mount -- those were beautiful rifles. If what I've read was correct, that sight was designed with the 1903 cartridge in mind, which fired a 200-grain roundnose bullet. When they went to a slightly different case throwing a 150-grain spitzer at higher velocity in 1906- thus the '.30 Government '06' cartridge- they didn't redesign the sight for the different trajectory. So what put the original load on at 300 yards put the new load on at 547. These are some of the cartridges that Firehand is discussing, in particular, number 2. "Originally, the 1903 Springfield was chambered for a round that almost immediately became obsolete—the .30-’03—even though at the time it was heralded as an improvement over the .30-40 Krag. 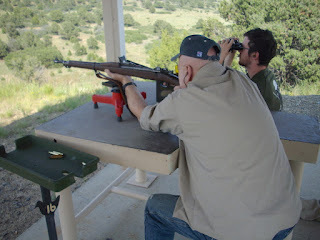 But, it used the same 200-grain, round-nosed bullet with a rainbow trajectory that sacrificed range and accuracy. The .30-’03 also built up excessive chamber pressures and, hence, recoil. "In 1906, the Springfield’s caliber was changed to what has become one of the most famous cartridges of all time, the .30-’06 Sprg. Designated “Cartridge, Ball, Caliber .30, Model of 1906,” it fired a 150-grain spitzer bullet (changed to a 172-grain boattail in 1926), which left the barrel at 2,800 fps. "This revolutionary new cartridge necessitated a slight redesign of the rifle, which included changing the rear sight to compensate for the flatter trajectory. The flip-up battle sights were optimistically calibrated for 2,850 yards. With the leaf down, the sight was set for 525 yards [not what the Army manual says, but near enough]."